Hamilton, Ontario – December 6, 2016 – Ford Motor Company of Canada has launched the Ford National Body Shop Network. Ford has selected Certified Collision Care as its strategic partner to administer and manage its body shop certification program and national network. According to a prepared statement, Ford Motor Company of Canada will be an integral strategic partner leveraging the joint-effort collision repair facility certification services, infrastructure and turnkey program offered by Certified Collision Care. "The Ford National Body Shop Network program was created to promote Certified dealership and independent collision repair providers to Ford vehicle owners and insurers," according to a press release from Ford. "The requirements are based upon the essential tools, equipment, training and facilities necessary to repair all Ford and Lincoln vehicles back to manufacturer specifications, including the new high-strength, military-grade aluminum-alloy used in the F-150 and Super Duty. This new program will provide dealers and independent collision repair facilities that meet the minimum requirements to be certified by Ford Motor Company of Canada and participate in the Ford National Body Shop Network. The program will ensure that Ford vehicle owners can choose a Certified collision repair provider to return their vehicle to OEM specifications, and ensure the vehicle's fit, finish, durability, functionality, value, and safety are preserved. This is particularly important based upon the increasingly complex vehicle design and repair requirements of Ford vehicles. " 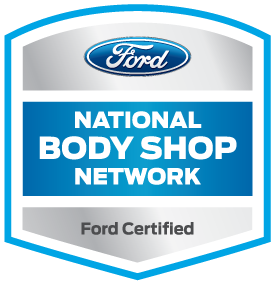 All qualified repair businesses can enroll in the Ford National Body Shop Network certification program, starting December 5, 2016. Certified shops will receive special Ford Certified signage as part of the integrated Certified Collision Care program and listing on the consumer-facing on-line shop locators and Smart Apps. "We are very excited to partner with Ford Motor Company of Canada to add the Ford National Body Shop Network Certified Program to our Certified shop's credentials, " says Leanne Jefferies, Vice President of Canadian Operations for Certified Collision Care. "Our joint-effort certification program provides top performing collision repairers an effective means to differentiate themselves in their market by aligning with the most powerful brands in the automotive industry. "